A proven, robust flood protection system. Unlike any other flood protection method our patented flood barrier systems Floodstop and FloodBlock offer a truly pragmatic solution to flooding. Floodstop and FloodBlock modular flood barriers are more cost-effective and infinitely more reliable than ineffective sandbags. Sandbags leak excessively – we do not recommend their use for flood protection. Wheather you are a private householder or business, or if you represent a local authority please contact us on 0800 66 66 47 or email info@supplyforce.co.nz for a free flood assessment (available in Auckland and Christchurch only). 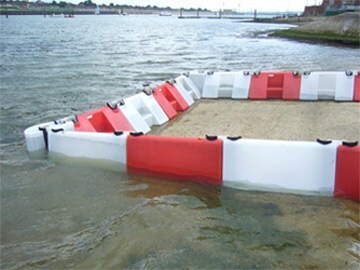 Our Flood Barrier products are available to buy or hire nationwide. The barrier can be assembled to any length and be arranged to suit any direction and opening. The system can be rapidly deployed by two persons with ease. 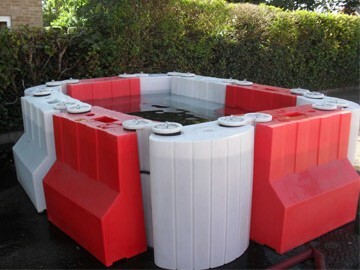 It is often used by construction companies or utilities to protect assets from flood risk. The flood barrier is assembled by connecting up the 1-metre long modular units using the universal key. When in use the majority of the modular units actually fill with the rising flood waters, which combined with the weighted universal keys ensures the assembled flood barrier holds back flood waters. All units and keys incorporate hard-wearing gaskets to ensure sealing. For acute cornering or wall connection in a Floodstop assembly a Multi-hub unit is simply used.In the above set up a free board is required. Over the last few years, there has been a rise in the number of natural disasters, such as the severe floods that hit Cumbria, in the north of England, in 2015 and Northern Ireland in 2017. These incidents can be devastating to local communities, damaging homes but also threatening communications – not just for residents to make calls and use the internet, but for the emergency services. The hugely important job of restoring those communications falls to BT’s Emergency Response Team (ERT). Day or night, 365 days a year if an exchange is threatened, members of the team are deployed to protect it. They work proactively – for instance, setting up Floodstop barriers outside exchanges to protect from flooding – as well as reactively, using high-tech pumps to quickly remove water after events like flash floods. Check out the video above to view BT and Floodstop in action! Rapid wall connection; no bolting required. An easy to assemble flood defences barrier that can be deployed to protect any opening or area from the risk of flooding. No bolting or fixing is required. 180-metres of our 0.5m high Floodstop flood barrier can be deployed in 90 minutes. Available to hire or buy. Our 0.65 high Floodstop barrier (also known as Floodstop 650) is our newest barrier in the popular Floodstop range. As with all our Floodstop barriers, Floodstop 650 can be assembled to any length and be arranged to suit any direction and opening. Our 0.9m high Floodstop barrier is an easy-to-assemble flood barrier that can be deployed to protect any opening or area from the risk of flooding. No bolting or fixing is required. Ideal for anyone at risk from higher flood heights, this system is popular with Utility and Construction Companies. 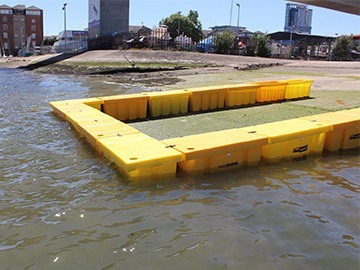 Floodstop was developed by Fluvial Innovations, and is part-owned by Bournemouth University. Their initial flood protection technology was invented during academia by the company’s Managing Director and founder. 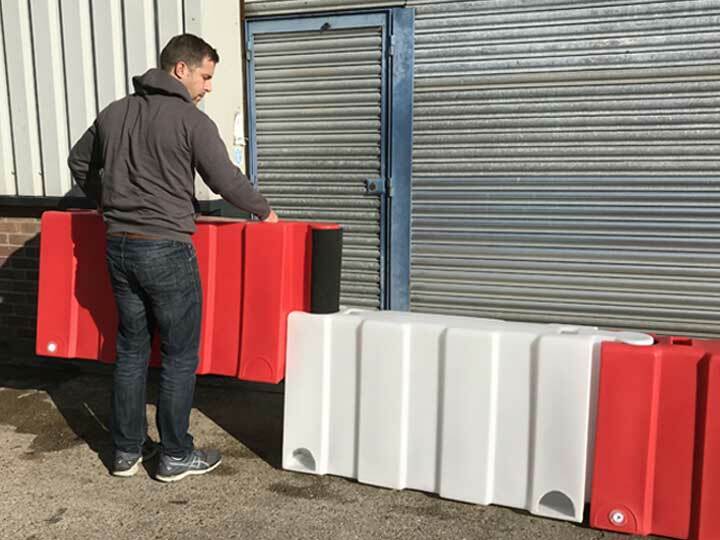 Fluvial Innovations has been working and supplying technology in the flood defence industry for over 10-years, and have supplied many miles of flood barrier to hundreds of customers around the world. A world-wide company, Fluvial Innovations have manufacturing and distributor networks set up in Europe, Asia and the America’s, New Zealand and Australia.